I while back, while strolling through the aisle of my local Asian market, when suddenly I spotted an interesting package I knew I had to have. It was a package of dried up little rosebuds not unlike potpourri. But on the back of the package were brewing instructions. These little dried up roses were meant to create rose flavored tea or rose water. The product description contained the following sentence : "red rose can help improve a dull complexion and skin moisture." Although I wasn't sure exactly what those words meant or if they were even true, but I needed to try it and find out. All of us probably have a bottle of rosewater sitting on a dresser that we mist our face with from time to time. But did you also know that rosewater drinks are becoming a thing? 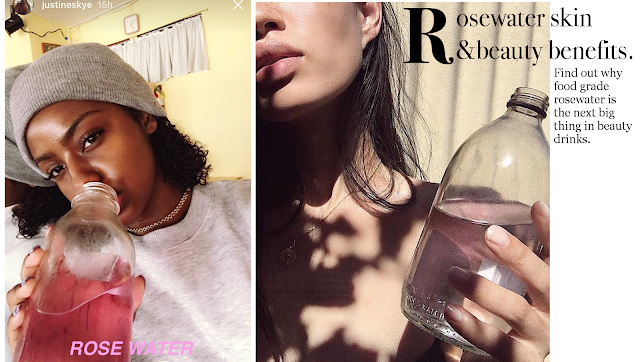 When you see an image of a celebrity sharing an image of themselves enjoying a large container of chilled rosewater, one has to ask....why is she drinking it? If you do a little research on the benefits of consuming rose water internally, the first and most touted benefit is it's anti inflammatory benefits. That's probably why rose water is so great when applied topically. But, did you know that rose water is a high anti-oxidant beverage containing vitamin A, B3 C, D, and E. In fact, the anti-oxidant properties were so potent that researchers compared it to vitamin E ( a powerhouse antioxidant). They also determined that rose water had the ability to inhibit lipid peroxidation. Oxidation is directly related to the aging process. And because rosewater is so effective in slowing down oxidation, it's being considered a viable medical grade treatment for free radical related diseases. That's powerful stuff. Its no wonder why these designer juice companies are quickly adding rose water drinks to their lineup. Please, don't reach for your facial toning spray and consume it. That stuff is not meant to be taken internally. Instead, you should seek out food grade rose water and there's a bunch on the market. Here's a little snippet from a couple happy customers who experienced wonderful skin benefits as a result of her faithful consumption of rose water. 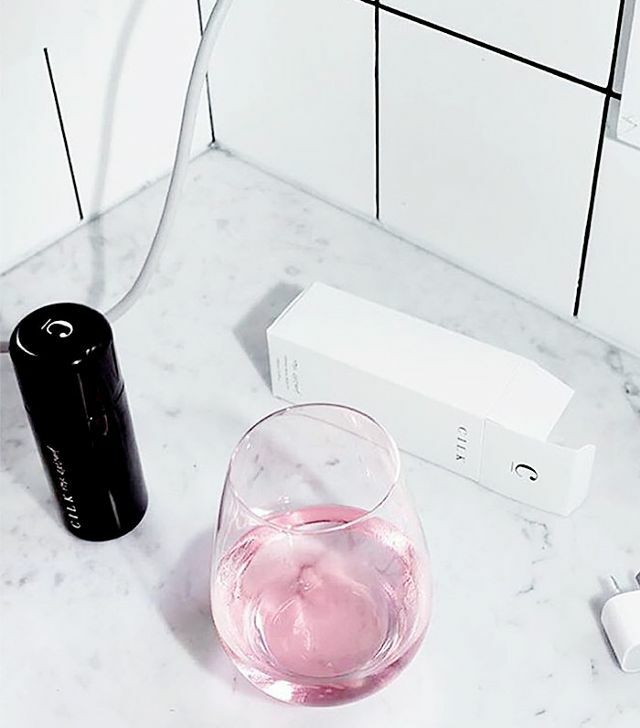 "...over the last several months I've been drinking h2rose religiously and have noticed my skin is much softer, I no longer have to use lotion like before and the quality of my skin all around is significantly better." I finished 12 bottles of All Beauty Water in exactly 12 days because I wanted to see if I would have instant results. I must say I am truly amazed at how beautiful my skin looks and feels. I stuck to the same skin care regimen wash routine so the only thing I can attribute my new glowing skin to is All Beauty Water. It is truly a miracle in a bottle and an added bonus is it tastes great. My skin looks healthy, refreshed and it is blemish free. I will make this a part of my daily skin care regimen. I got into drinking rose water this past winter. I brewed about a half gallon at a time but didn't get to drink it consistently because my husband acquired a taste for rosewater and would consume most of it. But, thanks to the gentle reminder from Justine Skye 's Instastory and learning about the powerful antioxidant affects online, I'm ready to jump back on the rosewater bandwagon. Make sure you get the real rosewater, not the one with rose flavoring. The bottles sometimes look really similar, but if you look at the ingredients it'll say water with rose flavor or parfum. I made that mistake once when buying it from an International Food Supermarket. Another tip: buy your rose water from the middle east section of an international rose water. Best quality, same for olive oil. I buy Palestinian or Lebanese olive oil. There is a noticeable difference!